Higher Education operates in an increasingly global context, and yet the examination of what drives and moves the field has remained largely focused on domestic campus leaders, national governments and institutional actors. International Organizations and Higher Education Policy expands the analysis to include the global drivers behind higher education policy, including a full array of influential organizations such as the World Bank, UNESCO, OECD, WTO, bilateral aid agencies and major private foundations. The significance of these organizations is especially pronounced in the developing world, where the expansion of higher education is happening in conjunction with the broadening influence of globalization. 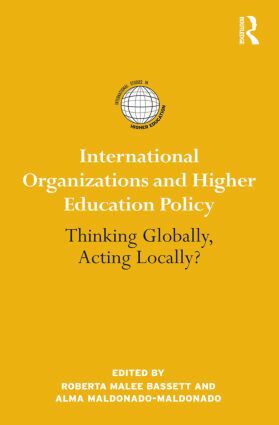 International Organizations and Higher Education Policy critically analyses the impact that these influential organizations have at different levels of policy development and implementation around the world. It examines their role in higher education institutions, examines the strength of these relationships, and exposes both the positive and negative implications. How international organizations represent the interests of the developed world and subsequently have an impact on the developing world. What ethical issues emerge when international organizations intervene in national policy-making processes. UNESCO and Higher Education: Opportunity or Impasse?